Please view the Monthly Calendar on the Service Schedule page on the parish website. Confessions are heard following Saturday Vespers or by appointment. 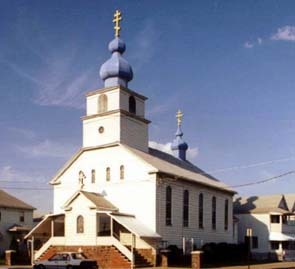 St John the Baptist Church had its origin in October, 1911 in what was then called Rhone, PA. Its humble beginning originated with a group of some eleven families and a few individuals who immigrated here from Europe. Faced with an enormous task, they began with the purchase of a double block home on the corner of Front and Welles St. This home was then moved to the back and was used as a rectory while the church was being built in the front. The first service was celebrated by Fr Kivko, who was succeded by the first permanent pastor, Rev A Salanka. In 1918, the Iconostas, the interior of the church and the icons were completed. There have been numerous improvements to the church, including remodelings, additions, and a new parish rectory, all resulting from the hard work and dedication of the parishioners and pastors through the years.